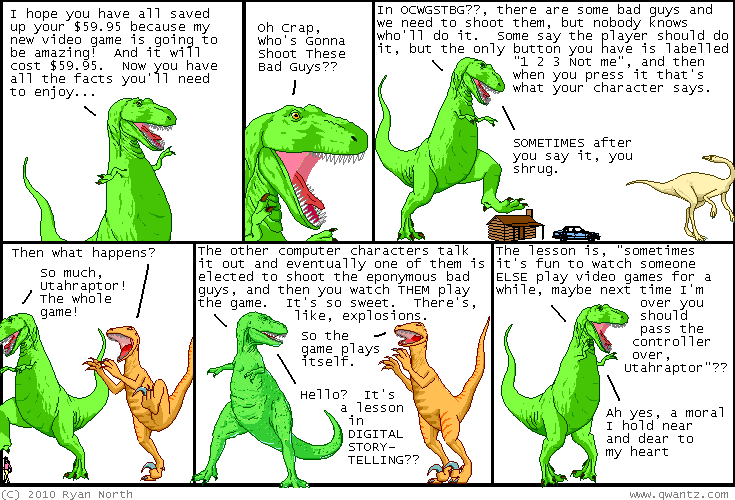 Dinosaur Comics - November 15th, 2010 - awesome fun times! November 15th, 2010: I have a digital picture frame in my living room, and any new photo you upload to Flickr and tag "chezryan" will show up there. The internet now controls the decoration of my living room. LET'S DO THIS. One year ago today: it was a four-way tie between "it only costs $50 bucks" and "it only costs 50 bucks" and "it only costs fifty bucks" and "it only costs $fifty bucks".